President Michel Aoun stressed that “what has been surrounding Lebanon has made it more attached to the bases, on which the country was founded, and to the democratic system, which despite its flaws was the meeting point of the Lebanese people,” stressing that Lebanese society has never been a hosting environment for extremism and rejection, but respect of freedom of religion and freedom of speech, as well the right to be different were part of the Lebanese people’s culture. Aoun also noted that the wars, even if economy was they real cause, cannot erupt on a solid ground, but need fractured and volatile grounds, adding that planting sectarian and racist strife can create the required fracture and incite the people towards war. 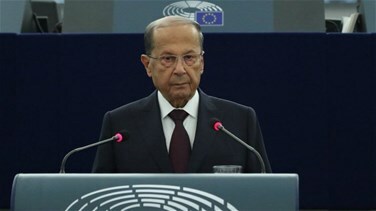 During a speech he delivered during the inauguration of the session of the European Parliament, the Lebanese president stated that Lebanon seeks to ensure a dignified a safe return for the refugees, rejecting any form of procrastination in this matter. He reiterated that the Lebanese state accepts any support to resolve the Syrian displacement, such as the Russian initiative, refusing to link it to the political solution that could take years to reach. Aoun considered the US decision to cut the funding of the United Nations Relief and Works Agency came to complete the Jewish national-state bill, noting that it is a start to impose settlement of refugees in the hosting countries, including Lebanon. The president stressed that his top priorities is fighting corruption, pointing out that the real work will start with the new government, which has the mission of boosting the economy and restoring security and stability in the country, as per the decisions of Cedre conference.